Signs fascinate me. Often, I remember signs more vividly than landscapes or buildings. Our vacation photos are littered with pictures of signs. I wonder about the decisions behind the sign, the choice of the right balance of words and imagery. How do you get the message across in the fewest words possible for native and non-native speakers? Sometimes, it's a matter of cutting through bureaucratic language to figure out what's going on. Other times it's all about understanding the context of the sign. 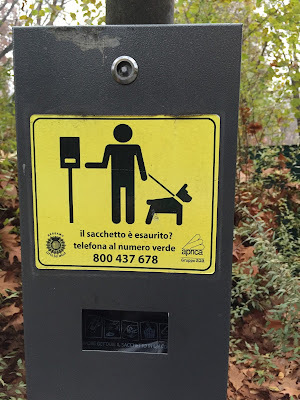 The first pictures I took when we landed in Bergamo, Italy were of signs. Each containing a mini-language lesson that I could study later in bed before dozing off. If the signs don’t use the best words or grammar, so be it, they can still teach me a new word or turn of a phrase. Imagine the surprise at an Italian party when I can complement the host on his arachidi in guscio. 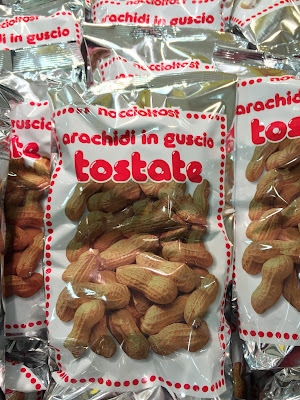 We were checking out local grocery stores and took this picture at Centro Commerciale Auchan Bergamo. 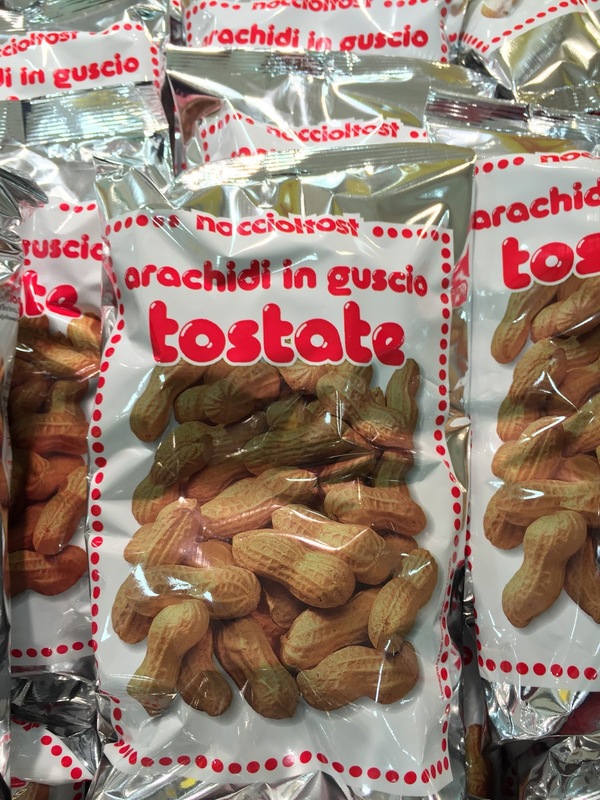 Let it be known: we turn our nose up at Auchan (French) and prefer Esselunga (Italian) when it comes to shopping. The Bergamaschi love their dogs, but dogs can’t shop at La Cascina Alpina where we saw this sign. 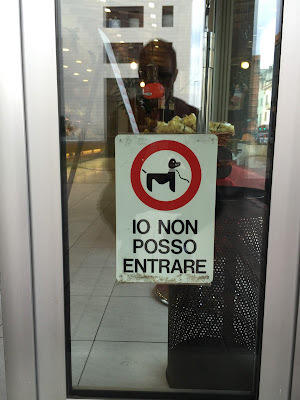 Dogs, however, can go into a surprising number of establishments in Bergamo. La Cascina Alpina has a nice cheese selection. We puzzled over this one for a while. 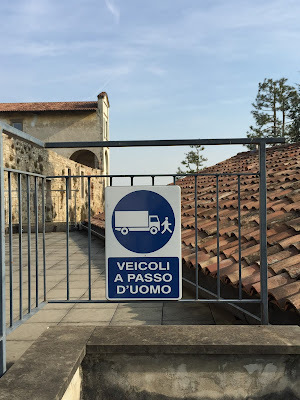 It was in the parking lot of the Università degli Studi di Bergamo: Biblioteca Umanistica, located in the Ex convento di S. Agostino. 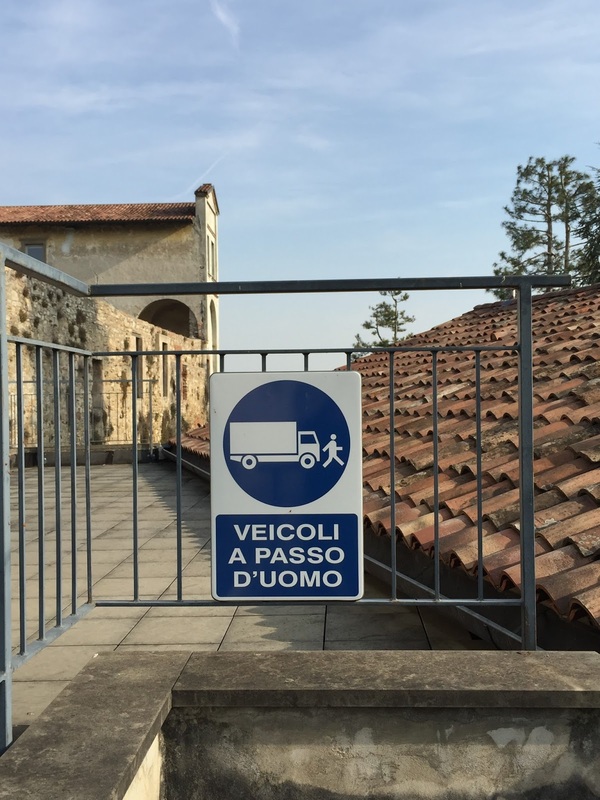 I first read it as “vehicles passing by the duomo,” which has a whole different meaning. Not really a sign, but we had to include this as there was a lesson here. I thought for some time it was a misspelling of the city Atlanta. What stupid graffitists, I thought. Well, it was more like, what a stupid tourist! 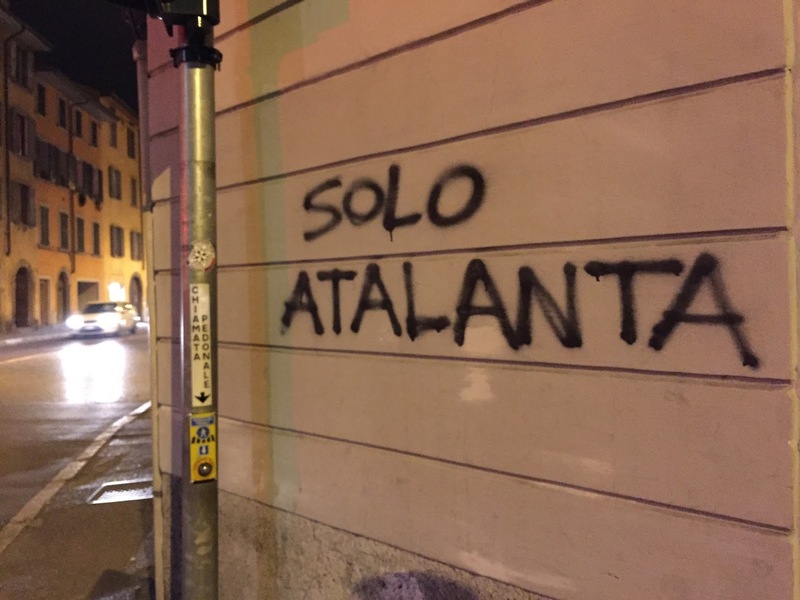 You would think that I would have done my homework before arriving in Bergamo to figure out that the local soccer team is Atalanta. On a related note, there is lots of soccer graffiti in Bergamo. The one I find interesting is how many times we see “1907,” the year the team was founded, written on walls. To think about: Should other historical dates be written on walls? 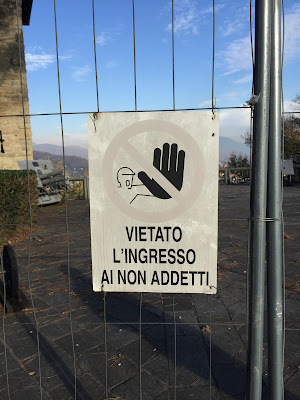 We spotted this sign while exploring La Rocca di Bergamo. We are not addetti. May be a walk on the wild side, who knows? This sign was at the top of via Pignolo. Exploring Parco Suardi one day, we say this sign. 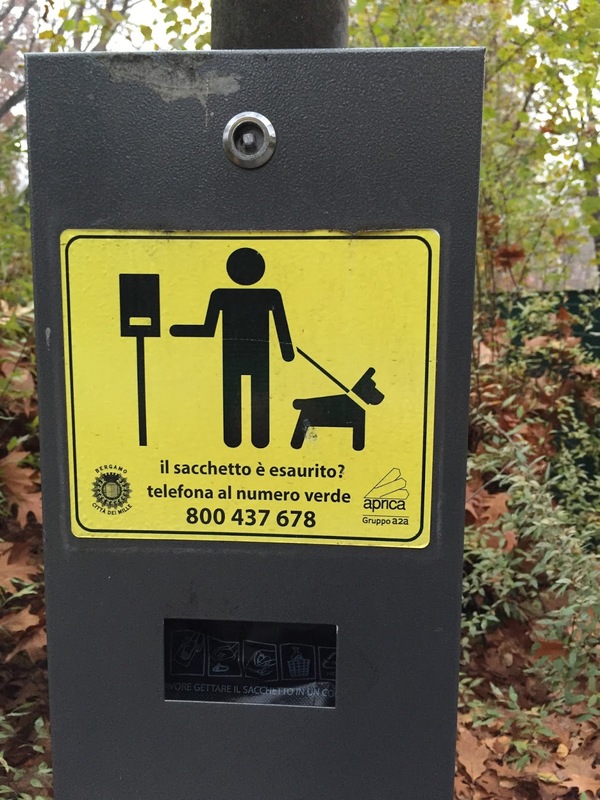 Judging by the amount of dog waste we see around, some Bergamaschi have not called this number. 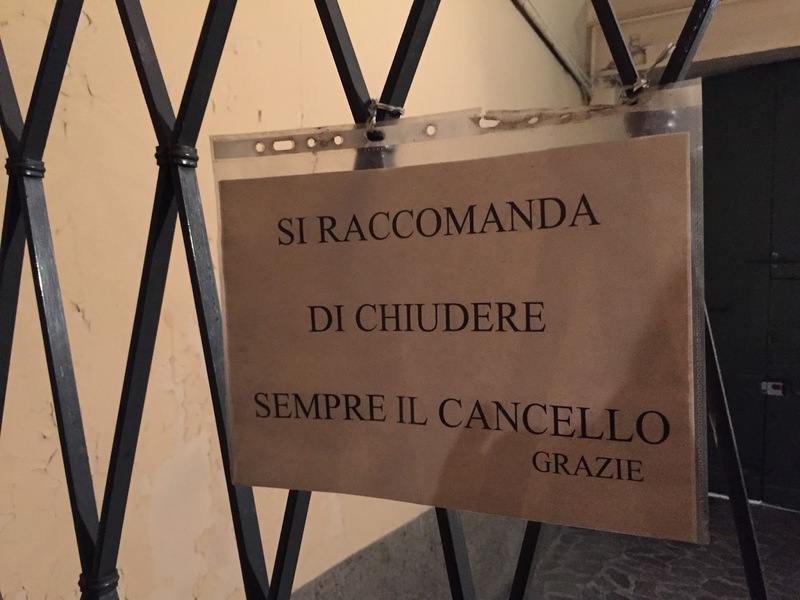 Cancelli like this are common in apartment buildings in Italy. The one pictured is the inner gate to a house on via Pelabrocco. It was the very first picture we took. 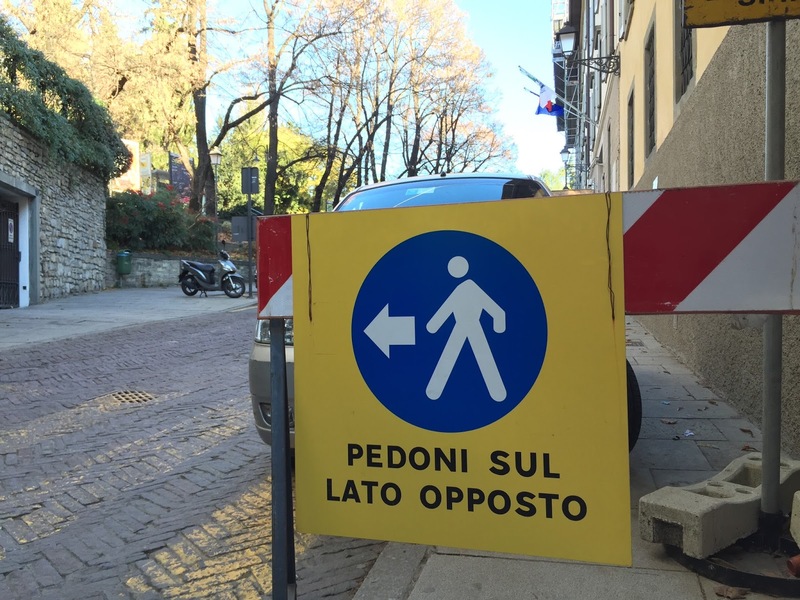 It’s a polite reminder, using an impersonal construction (“si raccomanda”), but we read it like a warm welcome, Benvenuti a Bergamo!